Our candidates have used our market-leading software to complete 1046 activities in the last 7 days. Analyse your skill set from Day 1 and watch your performance improve with the graphical and textual data provided to you within your results page. Textual data is output that enables thorough analysis of performance, including highest score, lowest score and average score, separated in to the assessed elements of each activity. Data from both basic and advanced difficulty activities is plotted on a dynamic colour-coded line graph that charts your progress and improvement over the duration of your subscription. A performance change indicator is also provided, displaying your improvement in each particular assessed element as a percentage over a 72 hour period. Attending an ab-initio or airline selection assessment? Ensure you’re competitive, discover how you compare to others, build upon your weaknesses and bolster your strengths. The average score, low score and high score of all users who have utilised our online preparation software to prepare for their assessment is also plotted on each graph, enabling you to compare your performance against others. Inclusion of this data provides a real-time (and realistic) overview of how well others are performing in these activities. A bar graph is also provided above each line graph, detailing your average performance against others. The bar graph is colour-coded, showing green if your performance is better than others, or red, if your performance is worse. 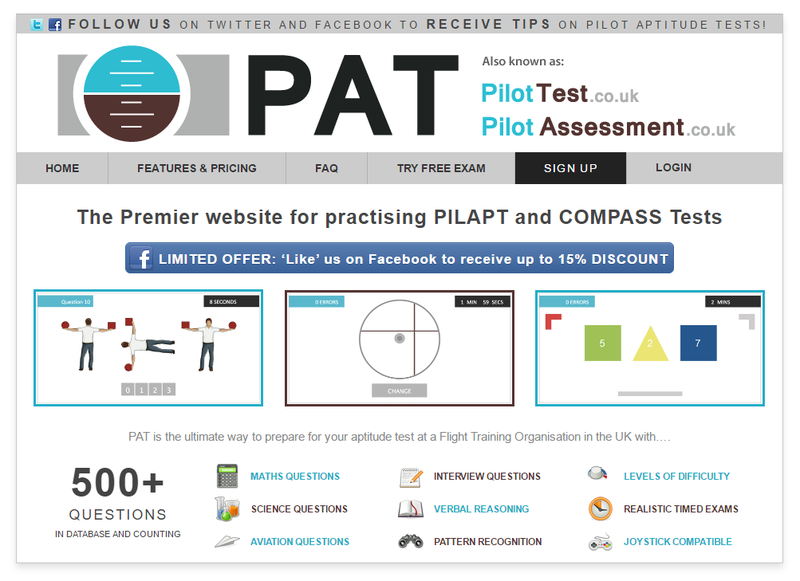 The ideal partner to your web browser-based preparation, PAT CoPilot is the companion application for PilotAptitudeTest.com candidates that enables you to take your subscription on the go, study theoretical content, flag questions and analyse psychomotor results, with compatible mobile devices. *SkyTest: EUR79.90 price per platform, theoretical total of EUR239.70. 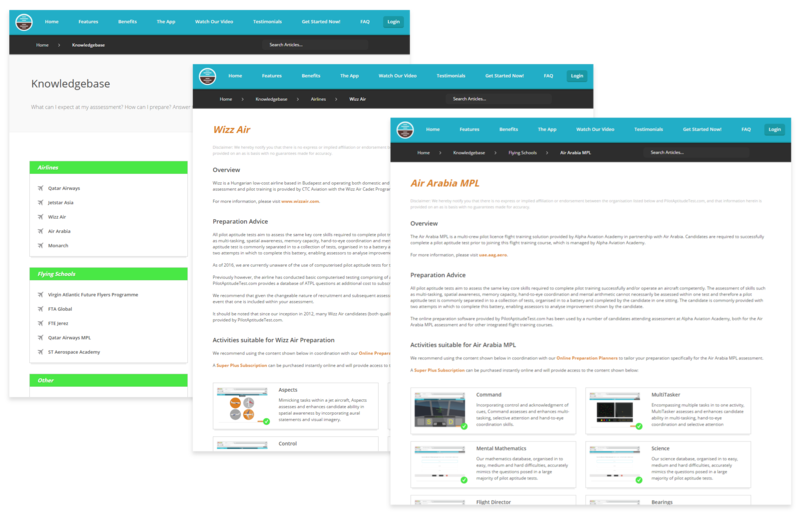 PilotAptitudeTest.com Super Plus Subscription: EUR50 price for multi-platform. Difference in price: EUR189.70. Assessment day tomorrow? No problem! Purchase access in a matter of minutes to the market-leading content provided by PilotAptitudeTest.com with a credit or debit card, facilitated by PayPal and Stripe, our online payment gateways. On completion of your transaction, register your chosen account details and start preparing immediately in a web browser. 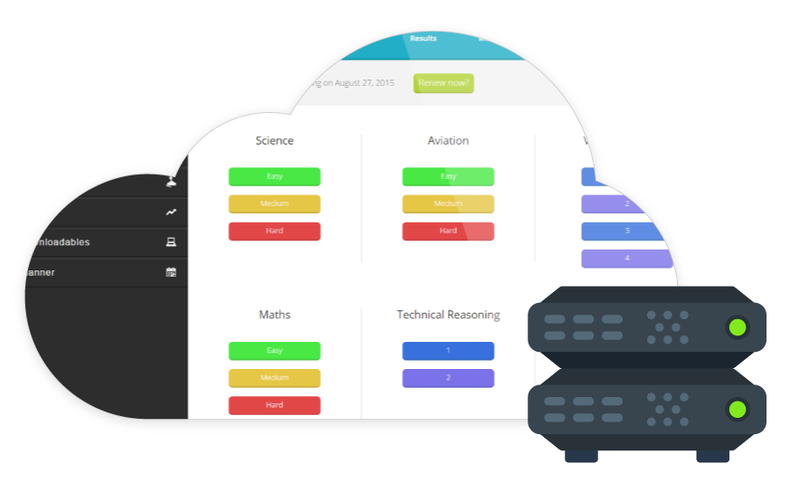 We offer both thirty and sixty day subscription packages for a one-time fee, providing candidates with the opportunity to prepare for computerised pilot aptitude tests 365 days a year, 24 hours a day. Our free Knowledgebase was created to fill a void in assessment knowledge which left a large number of candidates unsure how best to prepare for their assessments. It enables assessment candidates to find information on how they will be assessed at their upcoming airline, flight training organisation and military institution assessments. Get the upper hand on your assessment! Each article provides a brief overview of the organisation, followed by both general and organisation-specific preparation advice. We also provide recommendations on which content, available within our software, may be used for each assessment to obtain the best possible preparation. Unsure which preparation content is suitable for your assessment? Visit our Knowledgebase to learn how to prepare for over 100 different assessments. 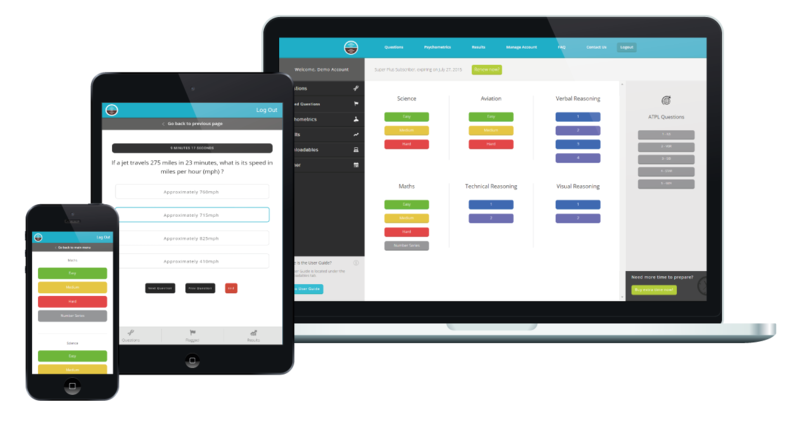 Our online preparation software can be purchased instantly online through this website, however our software is also distributed offline by a variety of industry-leading partners either in a retail environment or inclusive of a pilot training course. Over two-thousand candidates use our market-leading online preparation software on every continent every year. Purchase account access today and join the thousands of qualified and aspiring pilots using our software. Candidates are provided with theoretical questions covering a broad range of relevant topics, accompanied by psychomotor and psychometric activities that will enable you to analyse and enhance your skills in preparation for a pilot aptitude test at a flying school, airline, military institution or aviation recruitment agency. All content is provided in an accurate format, with theoretical questions provided in realistic timed examination environments and psychomotor and psychometric activities that correctly assess relevant aptitude. Results are displayed as clear, easy to understand text and graphs. 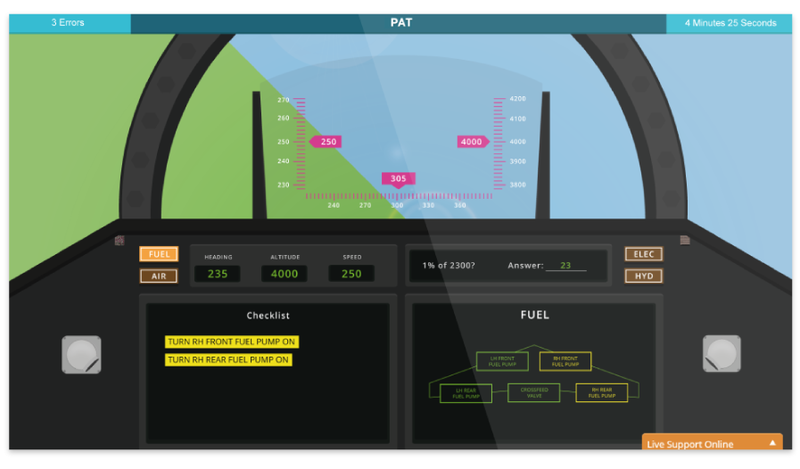 Our online preparation software comprises over one-thousand theoretical questions spanning scientific, mathematical, verbal reasoning, visual reasoning, technical reasoning, aviation and ATPL subjects. 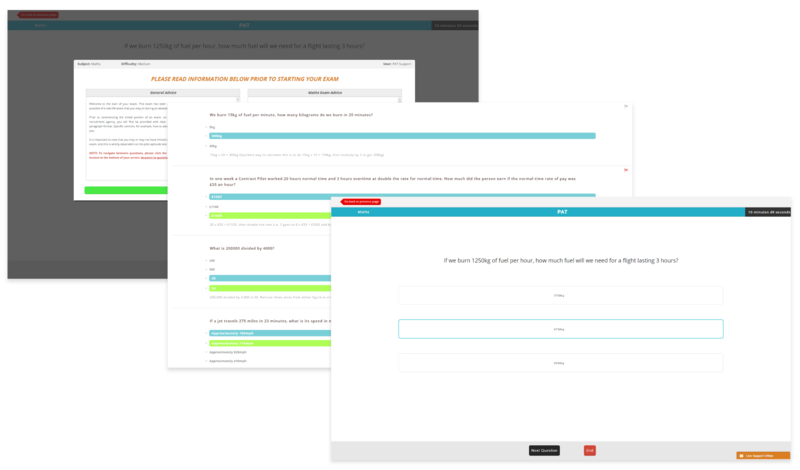 All questions reflect those commonly set in computerised or paper-based pilot aptitude tests. Candidates are provided with randomised, realistically-set and timed examinations in easy, medium and hard difficulties. Prior to each examination, candidates are also provided with detailed pre-briefs that outline the requirements of each. Timing is also representative of that found in pilot aptitude tests. On the completion of each examination, you are provided with a percentage score, a pass or fail score and individual question feedback. Our feedback is provided on the basis to improve the speed and accuracy with which you complete examinations. You may also flag problematic questions for later analysis. Over 100,000 activities completed in the last 12 months! Did you notice our live activity monitor on our homepage? This details the quantity of activities completed by candidates in the preceding twelve months, seven days and 24 hours. We have over two-thousand candidates on average (and increasing) using our online preparation software on a yearly basis to prepare for assessments in many aviation-related domains. Head over to our Frequently Asked Qustions page to discover the incredible volume of assessments previous candidates have attended after using our online preparation software to prepare, from aviation recruitment agencies and airlines to flight training organisations and military institutions, our market-leading software is considered the best way to prepare for assessment. Click here to see the list of assessments candidates have attended. To get the most from our online preparation programme, a large number of our psychomotor and psychometric activities enable the use of a joystick for enhanced learning and greater realism. To use a joystick with our software, simply download the pre-configured application, connect your joystick and start preparing. We recommend using the Logic3 ProFlight joystick, as pictured. Quickly and easily access the full content provided by our online preparation software within a web browser from the cloud all over the world twenty-four hours a day without interruption. Our cloud-based service is delivered by a dedicated server and content delivery network working in tandem. Our cloud-based service also ensures that unlike other software, you do not need to install anything and may commence preparation in a web browser immediately. We’re different to others, our online preparation software was developed by commercial pilots, many of whom have sat computerised and paper-based pilot aptitude tests as part of ability assessment and career progression. Benefit from our experience and improve your chances of success. The market-leader for over five years! We are passionate about providing the most comprehensive and cost-effective method for candidates to prepare for their pilot aptitude tests, and will continue to invest time and money into our business development to ensure that all candidates receive a first-class product. Pictured left is the first ever iteration of our website.